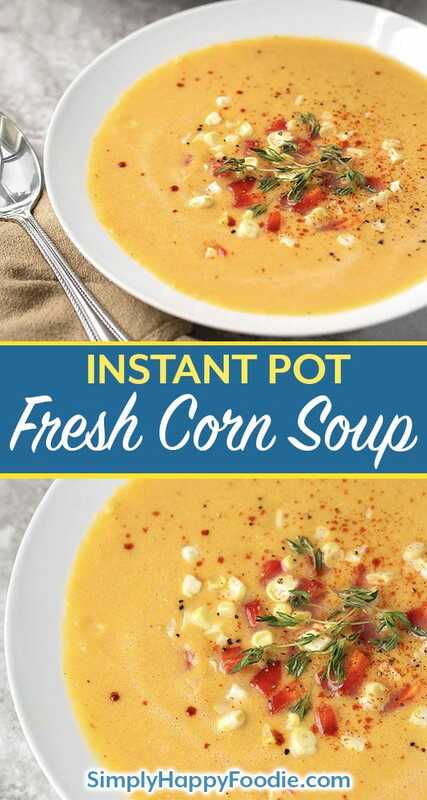 Instant Pot Fresh Corn Soup is fresh and delicious, vegetarian and healthy. The perfect meal to make with the end of Summer fresh corn! This is a creamy soup without the cream! Intense corn flavor comes from cooking the cobs with the soup to make a flavorful broth. Paul and I visited a local corn grower and picked up some beautiful ears of farm fresh corn! 3 for a dollar! Up here that is a good price (.79 ea. at the grocery store). I knew I wanted to make a vegetarian soup that featured an intense corn flavor. I’m not a vegetarian, but there are times when I crave a veggie-only meal. I want my vegetables to shine on their own. 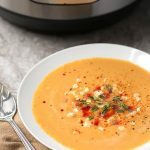 For this Instant Pot Fresh Corn Soup the best way to get that intense corn flavor is to cook the cobs right in there with the soup (after you have cut the kernels off)! I also make a cob broth for my Salmon Chowder recipe. Cooking the cobs in the soup gets all of that tasty, starchy corn milk out, and extracts more good corn flavor! I like a creamy soup, but sometimes I don’t want the actual cream. So I put my Vitamix blender to good use and blend the soup after it cooks. It’s easy, and as long as you are careful (hot soup), it’s easy! And now you have a creamy soup that is healthy! I had to stare in open-mouth wonder as son Bryen gobbled up a big bowl of this. 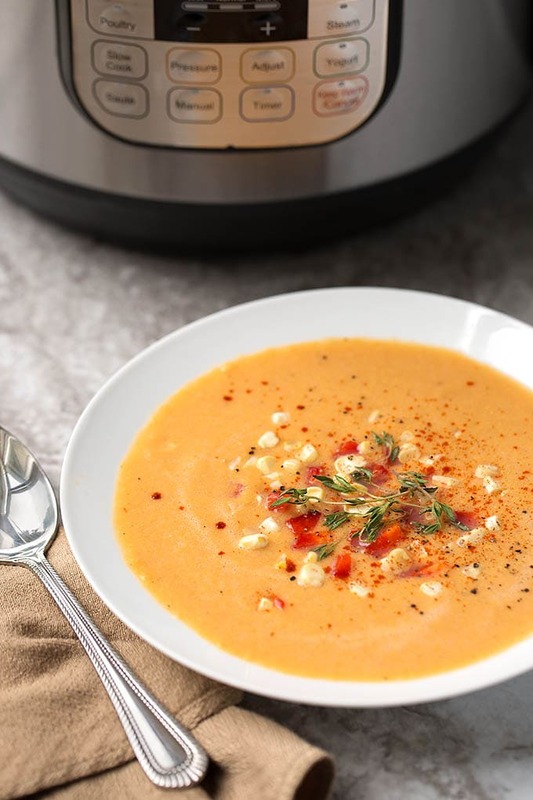 He usually likes to eat meat, and yet he just loved this Instant Pot Fresh Corn Soup! Go figure! Fresh and delicious. Vegetarian and healthy. 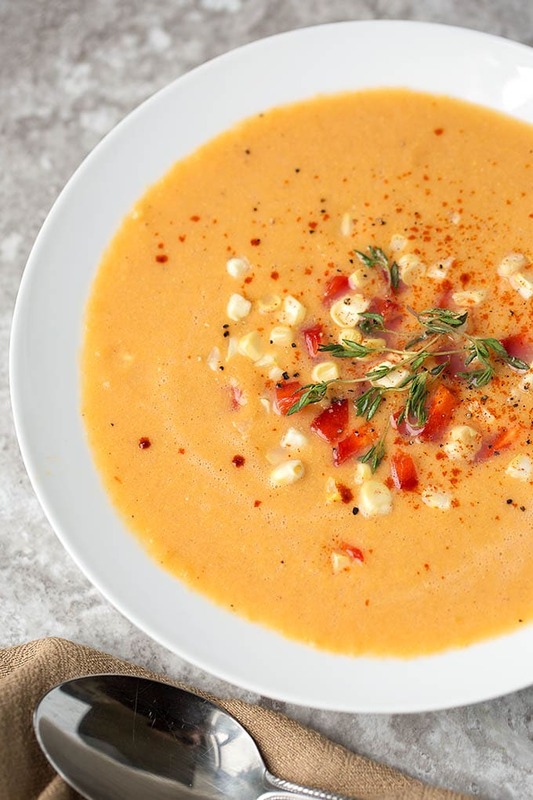 Instant Pot Fresh Corn Soup is the perfect meal to make with the end of Summer fresh corn! Intense corn flavor comes from cooking the cobs to make a flavorful broth. A creamy soup with no cream! Cut the kernels off of the ears of corn and set 1/3 of them aside. Cut cobs in half crossways and put into the pressure cooker pot, along with all of the other ingredients (except 1/3 reserved kernels). Press Manual (or Pressure Cook) and the +/- button to choose 12 minutes. When cooking cycle ends, let the pot naturally release pressure for 10 minutes. Then Manually release the remaining pressure until the pin in the lid drops. Open the lid and use a ladle or large spoon to remove the corn cobs. Discard. Carefully transfer the contents to a blender (Be very careful, and only fill blender 1/3 way with the hot contents (check mfg recommendation). Hold the lid down and start the blender slowly so it doesn't pop off! You will probably need to blend in 3 batches). Stir in the reserved corn kernels. Taste and adjust salt if needed. Garnish as you like and serve hot or chilled. I did try an immersion blender to get this soup creamy. It didn't work for me. Someone asked about this so I wanted to let you know. It may be because my immersion blender isn't a good one. Or maybe it's the corn. I'm not sure. Calories calculated using water instead of broth. Funny you should mention that, Judy! When I first made this recipe, that’s exactly what I did. And it splattered all over (nothing that draping a paper towel over the pot couldn’t help). But it didn’t get the soup as creamy as I wanted. Maybe my immersion blender isn’t a good one, but the corn just wouldn’t get all blended. I do use my immersion blender often. It might just be the corn. Dunno!